Pharos Marine Automatic Power's explosion proof Zone 1 and 2 battery boxes have the versatility to house any type of Nickel Cadmium or Lead Acid battery from all recognised battery manufacturers. 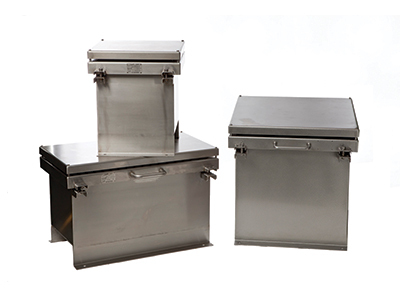 Available in 316L stainless steel and galvanised or painted steel, the battery box is suitable for all environmental locations. PMAP's batter boxes are the most flexible and user-friendly units on the market due to each box being built to customers' bespoke sizing and specifications.